This dish is oh, so easy and oh, so delicious! Well, I guess I think it’s tasty because I am a sucker for just about anything with balsamic vinegar and basil and cheese. Oh, and I suppose I love pasta too. The dressing/sauce that goes over your pasta and chicken is punched with flavor thanks to the balsamic vinegar, garlic, and basil. YUM! And really, does it hurt to have two different kinds of cheeses sprinkled on top? Well, maybe it does increase the calories a little, but if you can afford theses calories . . . they are SO worth it. If you can’t, eliminate the cheeses (which still yields a delicious final dish) and you’ll save yourself 50 calories per serving. I used soba noodles here. They are made with buckwheat (which makes them healthy, adds protein, and they are also gluten free). They are usually found on the Asian isle of your grocery store and are almost always sold in all health food stores (like Good Earth or Sunflower Market). 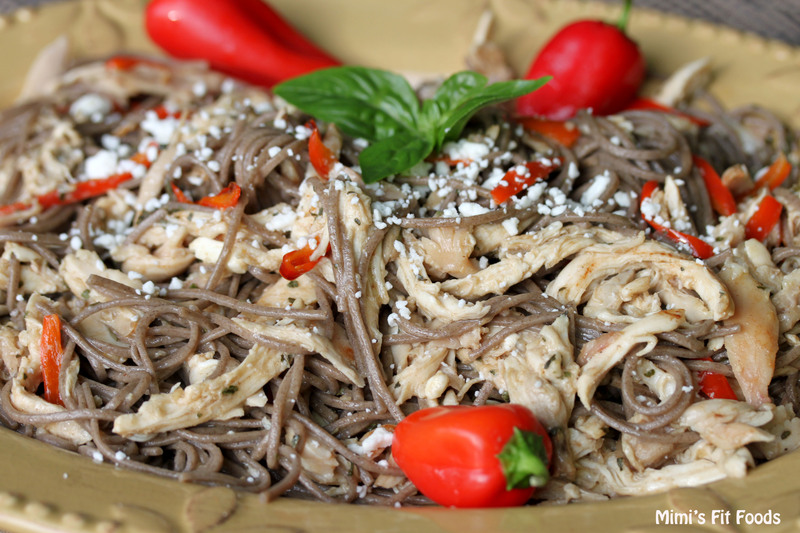 If you haven’t cooked or eaten soba noodles, don’t let that deter you from this recipe. They are worth a try. They taste WAY better than they look and they cook up WAY faster than other pastas. I hope you love this as much as I did. If you make it, will you call me over? Heat a large pot of water to a boil. Add the soba noodles and and cook until just tender according to package directions. Drain. In a small bowl, whisk together vinegar, garlic, basil, salt and pepper. When combined, slowly whisk in the olive oil until the dressing is completely combined. While the pasta is boiling, heat 1 teaspoon olive oil in a 12-inch non-stick skillet over medium heat and add the bell pepper. Cook briefly until crisp-tender. Add the cooked chicken and cook for 1-2 more minutes, until the chicken is heated through. When the noodles have been drained, add the hot noodles to the skillet with the red pepper and chicken and toss. Add the shredded or cubed mozzarella and toss quickly to combine before the cheese melts. Pour the dressing over the top and toss with tongs to coat all the ingredients with the dressing. Serve warm or at room temperature. Your post makes me realize I need to make this again! I love the idea of using soba noodles, too.